Russia and India added their voices on Monday to China's call for a new world order and endorsed Beijing's plans to mark the 70th anniversary of the end of the second world war. In a joint communique, the three nations vowed to "build a more just, fair and stable international political and economic order" and a "multi-polar" world. 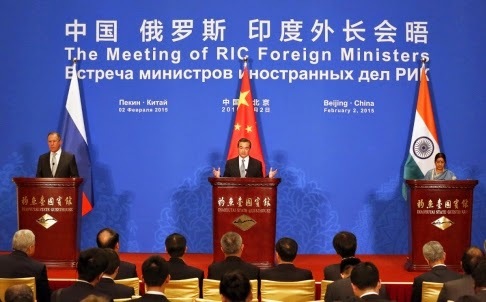 Russian Foreign Minister Sergey Lavrov said all states should be involved in creating "a modern security architecture" in the Asia-Pacific; his Chinese counterpart, Wang Yi , said the region should not be caught up in a zero-sum game. 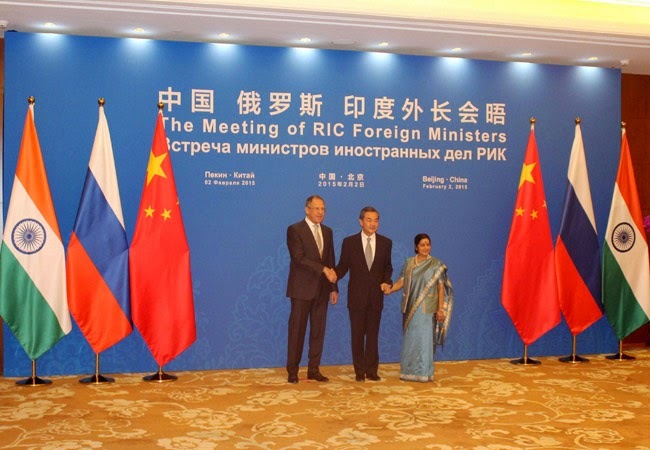 India joined hands with Russia and China on Monday to fight terror, pledging at their 13th trilateral meeting to crack down on not only terrorists but also those who finance and give refuge to them. The three nations issued a strong joint statement on terror, saying religious, racial and ethnic divisions were no justification for terrorism. Without naming any country, the communiqué said there was a need to “bring to justice perpetrators, organisers, financiers and sponsors of terrorist acts”. China is pushing for the development of an economic corridor to Pakistan as a key component of its national development strategy of "One Belt and One Road," according to the Shanghai Securities News. During a meeting with Sardar Ayaz Sadiq, speaker of the National Assembly of Pakistan, on Jan. 30 in Beijing, Chinese premier Li Keqiang said that a Sino-Pakistan economic corridor functions as the strategic framework for the cooperation of the two nations. Shanghai Securities News said the Sino-Pakistan economic corridor project will begin implementation this year, highlighting the construction of major transportation infrastructure. The Islamic State (IS) has killed three Chinese militants who tried to leave the group, an official from the Kurdish security force in Iraq told the Global Times. The Kurdish security official said Wednesday that in the past six months, IS has executed 120 of its members who attempted to escape from the group and leave Iraq and Syria. Among the 120, three were Chinese citizens and were members of the East Turkestan Islamic Movement (ETIM), a terrorist organization that is also known as the Turkistan Islamic Party. Singapore-based Chinese news portal zaobao.com earlier reported that around 300 Chinese extremists were fighting for IS in Syria and Iraq after travelling to the two countries via Malaysia. Ramzan Kadyrov has accused the US and other Western nations of “spawning” the Islamic State (IS, formerly ISIS/ISIL) terrorist group in order to incite hatred towards Muslims all over the world. “Today, no one doubts the fact that this group has been spawned by America and other Western countries in order to spark hatred of Islam in the hearts of people all over the planet, to stop the process of mass conversion to Islam,” the head of the Chechen Republic wrote on his Instagram page. Kadyrov also suggested the West was backing IS in order to distract public attention from numerous problems in the Middle East, in the hope of destroying Islamic nations from inside. 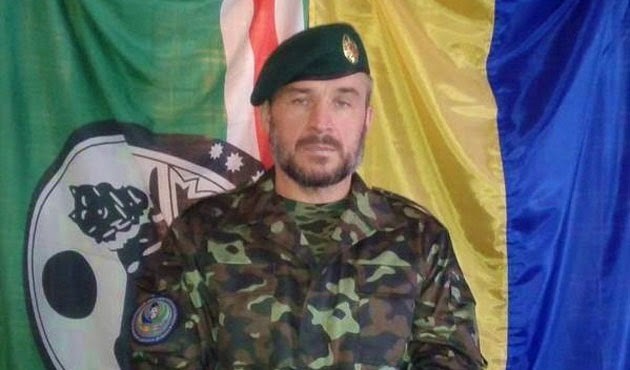 Prominent Chechen commander Isa Munayev has reportedly been killed in eastern Ukraine, where he was battling alongside Kiev government troops against pro-Moscow separatists. Munayev — a veteran of Chechnya's wars for independence from Russia — was killed Sunday near the town of Debaltseve, said Amina Okuyeva, a press officer for the Dzhokhar Dudayev peacekeeping battalion, which Munayev commanded. He was providing cover for Kiev-loyal forces that were withdrawing after "successfully completing a mission" when he was killed by artillery fire, Okuyeva said Monday in a statement posted on the Odessa Crisis Media Center website. A native of Grozny Adam Osmaev, who had been once accused of plotting a terror act against the Russian President Vladimir Putin, has headed the "International Peacemaking Battalion named after Dudaev", created by Isa Munaev, a former Chechen field commander, and taking part in the war in Eastern Ukraine as a part of the antiterrorist operation (ATO). In October 2014, the Ukrainian Prosecutor's Office excluded the terrorism article from his indictment. On November 18, 2014, the Primorsky District Court of Odessa found Osmaev guilty of illegal handling of explosives, reckless destruction of another's property and forging documents, sentenced him to 2 years 9 months and 14 days in jail and released him in the courtroom, because he had already served this term in the SIZO. Former Georgian President Mikheil Saakashvili confirmed on Monday that he is ready to fight for the post of Ukraine’s national anti-corruption bureau chief. 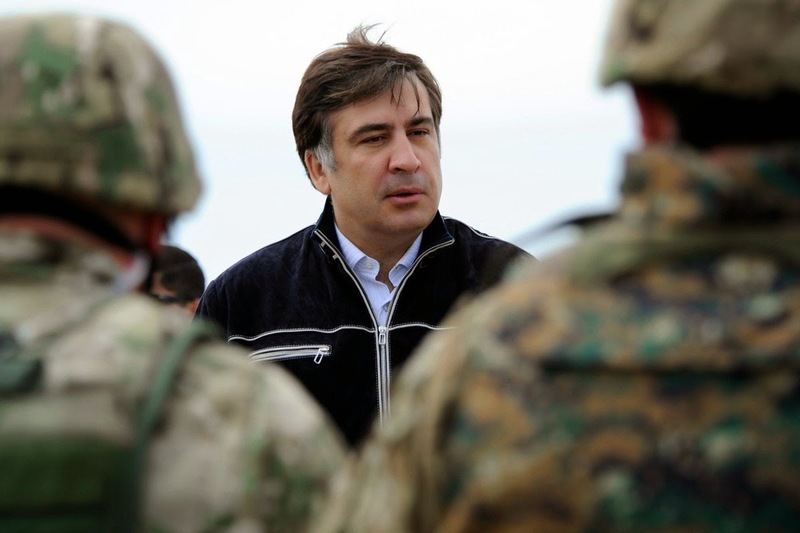 In an interview with the Censor.net news portal, Saakashvili said corruption is one of the main enemies of Ukraine and he could introduce an action plan based on Georgia’s experience of fighting against corruption. Saakashvili said he could use his international ties to focus on the issues of returning to Ukraine the arrested assets of a corrupt group linked to former Ukrainian President Viktor Yanukovych. Georgian Justice Minister Zurab Adeishvili, who has been wanted for more than a year and is subject to an Interpol Red Alert, was recently spotted in Ukraine. NATO's plan of setting up a training center in Georgia is a step towards escalating tension in the Black Sea region, Russia’s representative at NATO Alexander Grushko told reporters on Friday. "A training center in Georgia is a step, which cannot be taken other than provocative. NATO does not need any centers," the diplomat said. "We shall be looking into the issue, but establisheng NATO military objects in Georgia is a step towards tension and aggravation of the regional security." "Our position is that in the Black Sea region there are all conditions to have security provided by regional states. I mean by countries of the Black Sea," he said.